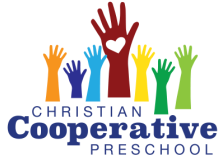 Christian Cooperative Preschool is a family-centered, Christian preschool that has been celebrating learning through play while encouraging self-expression and confidence for over 50 years. By incorporating families into the classroom, CCP provides a unique learning environment that allows families to have in-class participation on a regular basis and extends the learning beyond the classroom to the home. ﻿What is a Cooperative Preschool? Have hands-on participation in your child's learning experiences. Connect with the teacher and other parents regarding educational, parenting and developmental issues. Model a life-long value of education. Choose from a rich variety of daily activities including art, imaginative play, music, outdoor play, science, circle and story times. 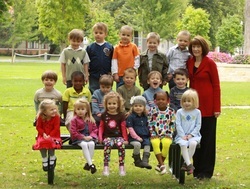 Participate in monthly field trips, Christmas program and spring Open House. Learn from the teacher, their own parents and other parents in a supportive learning environment. Work together, sharing responsibilities and experiences as part of a group.